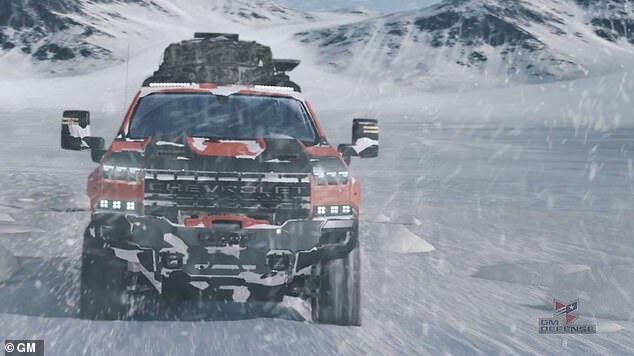 The Chevrolet Silverado ZH2, developed in conjunction with the U.S. Army Tank Automotive Research, Development and Engineering Center, is a hydrogen fuel cell-powered vehicle that sits on a stretched midsize pickup chassis, and stands over 6.5-feet-tall, riding on 37-inch tires capable of tackling any terrain. The fuel cell enables the vehicle to be near silent, reducing both the acoustic and thermal signatures and making it ideal for stealth operations. An Exportable Power Take-Off unit lets it power equipment away from the vehicle, and the water by-product can come in handy in dry conditions. Continue reading for another video and more information. “Instead of a battery pack, the Silverado is equipped with three tanks of hydrogen for a Hydrotec-branded fuel cell that generates electricity and provides stealthy, but powerful performance over a 400-mile range. It is designed to be flexible enough to be reconfigured for various missions, powerful enough to replace the trucks that drag heavy things around today’s battlefields, and agnostic about whether it is driven by a human, remote control, or an autonomous driving module,” reports The Daily Mail.